Russian President Vladimir Putin talks with German Chancellor Angela Merkel as they attend the International 70th D-Day Commemoration Ceremony in Ouistreham, France. Russian President Vladimir Putin has discussed the potential cost for Europe of Russia's gas dispute with Ukraine in a telephone call with his German and French counterparts, the Kremlin said in statement. 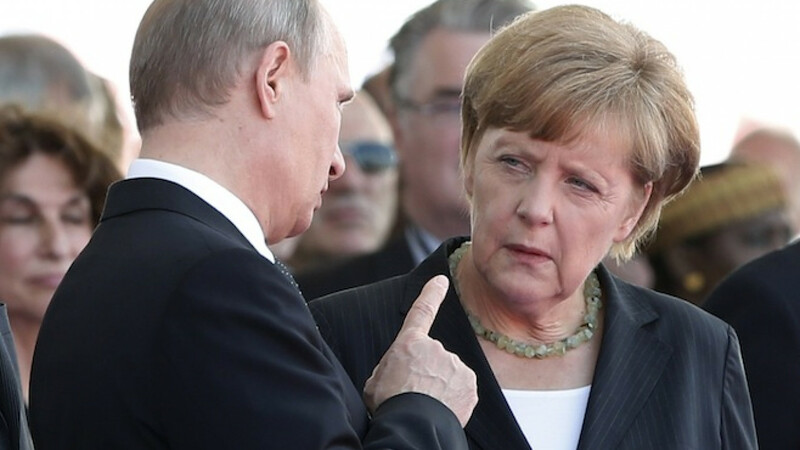 In a three-way call with German Chancellor Angela Merkel and French President Francois Hollande on Thursday, Putin also voiced "serious concern" over Ukraine's military operation against a pro-Russian uprising in the east, it said. "They also discussed the potential consequences for Europe's energy security and economy of the failure of negotiations with Kiev on the settlement of its debt for Russian gas deliveries," the Kremlin said.